Honors College juniors Emily Strobaugh, Hallie Nelson and Matthew Preisser have been nominated for the Harry S. Truman Scholarship. The Truman Scholarship Program was established to provide scholarships to outstanding students who are committed to a career in public service. Created in 1975 by an act of Congress, The Harry S. Truman Scholarship is awarded to approximately 60 college juniors each year on the basis of four criteria: service on campus and in the community, commitment to a career in public service, communication ability and aptitude to be a “change agent,” and academic talent that would assure acceptance to a first-rate graduate school. More broadly, Truman Scholars possess intellect, leadership skills, and passion that would make them a likely force for the public good in any field. Scholars receive an award of $30,000 which will go toward post-graduate education. In addition, Truman Scholars participate in leadership development programs and have special opportunities for internships and employment with the Federal government. 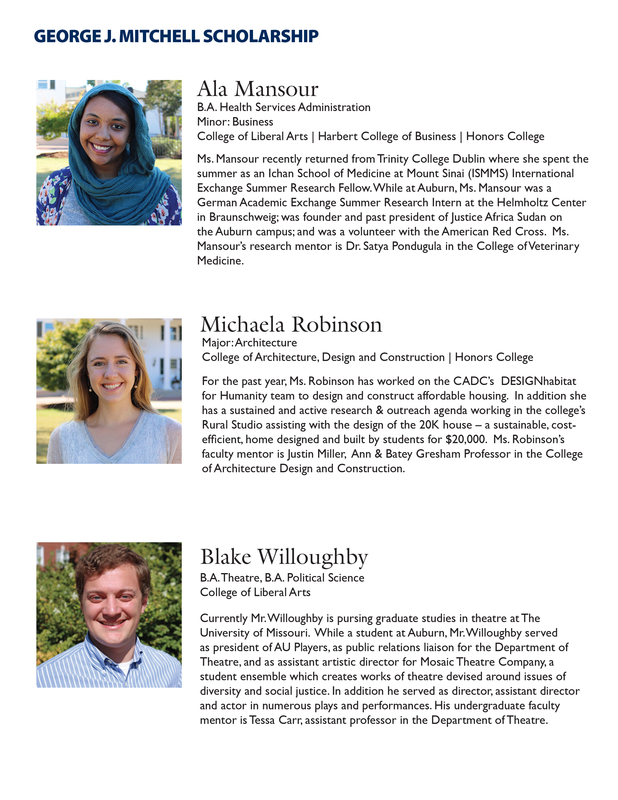 Here are the three Auburn University students nominated for this year’s Truman Scholarship. Ms. Emily Strobaugh, a Prattville, Alabama native and Honors College junior, is pursuing a double major in English Literature and Global Studies and a double minor in Spanish and Human Development & Family Studies within the College of Liberal Arts and the College of Human Sciences. 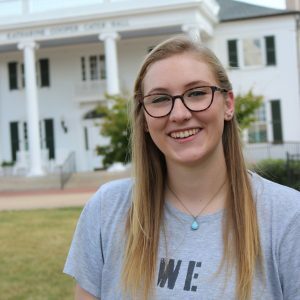 Since enrolling at Auburn in the fall of 2014, Emily has played an active role in the founding and organization of “Honors Serves” the Honors College service initiative. 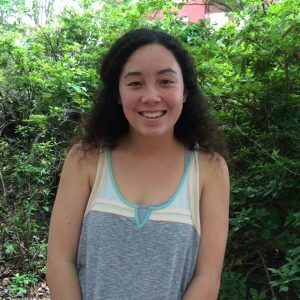 As one of the first cohort members of Honors Serves, Emily has devoted hundreds of hours in community service projects ranging from home repair and rehabilitation to leading a semester’s long effort tutoring in rural Greensboro, Alabama to spending an alternative spring break delivering water to the residents of Flint Michigan. Emily has recently completed a summer internship in Nashville with World Relief – an international refugee rescue and resettlement organization. During her time with World Relief she was tasked with working on their career development program for new Americans with professional backgrounds such as engineers, nurses, and physicians. Her responsibilities ranged from teaching business English to organizing career training days to proposal writing. One of her proposals recently paid off with an award of $10,000 in support for World Relief. 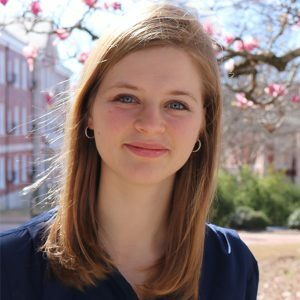 Ms. Hallie Nelson, from Birmingham, Alabama, is an Honors College junior majoring in Biosystems Engineering with minors in Spanish, Sustainability Studies, and Community and Civic Engagement within the Samuel Ginn College of Engineering, University College, and the College of Liberal Arts. Among her many activities she served as co-chair of Auburn’s Women’s Leadership Conference, as a peer-facilitator in the Hunger Studies minor and tireless advocate in the War on Hunger, as a field-worker and community food assessment research intern in Alabama’s black-belt, as Director of Facilities with the Auburn Student Government Association, as a living wage advocate for Auburn University employees, as an Auburn University Global Challenge Fellow where she served as chair of sustainability, and since her freshman year has held several leadership roles in Campus Kitchens where she currently serves as the organization’s president. Campus Kitchens is a national, student powered hunger relief effort that utilizes recovered food from the campus cafeterias, campus-wide sports venues, and Auburn area restaurants to prepare and distribute to those in need in the Auburn-Opelika-Tuskegee communities. Hallie spent last summer at the Center for Disease Control and Prevention (CDC) as a Collegiate Leader in Environmental Health Fellow where among her many responsibilities she assisted in building low-cost air pollution sensors that will be used in at-risk communities which are situated near polluting industries. Mr. Matthew Preisser an Honors College junior from Katy, Texas, is a Biosytems Engineering major with a minor in German within the Samuel Ginn College of Engineering and the College of Liberal Arts. 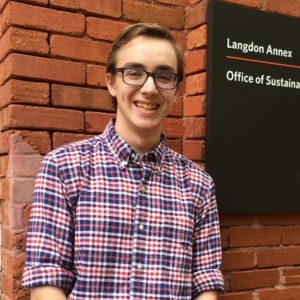 Matthew is in his second year as an intern with the Office of Sustainability where he recently created a sustainability map layer for the campus on the Auburn University web-page. Creating this layered map required identifying topics and locations to feature, and then working closely with the Office of Information Technology (OIT) to integrate the sustainability features layer in the campus map. In addition, Matthew recently completed a ten-week competitive summer internship at the Seattle office of the Pacific Northwest National Laboratory through the Department of Energy Science Undergraduate Laboratory Internship (SULI). As a summer intern with the Pacific Northwest Laboratory, Matt was tasked with examining the environmental effects of marine renewable energy (MRE) by sifting through meta-data collected from around the globe, utilizing internet analytics and geolocation technology to find correlations. Utilizing Tethys – an interactive database that acts as a central clearinghouse for MRE – Matthew’s work brought him into contact with top researchers in the U.S. and in Canada. The prestigious Barry M. Goldwater Scholarship Program was established to provide scholarships to outstanding students who intend to pursue careers in mathematics, the natural sciences, and engineering. Each scholarship covers eligible expenses up to a maximum of $7,500 annually for undergraduate tuition, fees, books, and housing. In awarding scholarships, the foundation of trustees considers the nominee’s field of study and career objectives along with the extent to which that individual has the commitment and potential to make a significant contribution to the field of science or engineering. 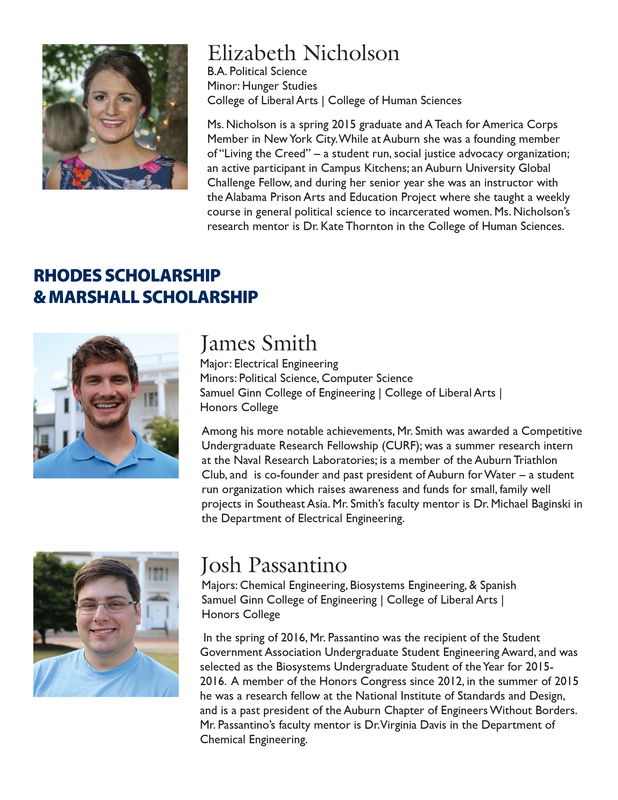 Four Auburn University students were nominated for the Goldwater Scholarship this year. Ms. Madison Gohlke, an Honors College junior from Anniston, Alabama is pursuing a major in Animal Sciences. Madison’s research, under the direction of Dr. Terry Brandebourg, Associate Professor in the Department of Animal Sciences, examines hyperphagic obesity in the Mangalica pig and its linkage to metabolic disease. For the past two years Madison has successfully developed a novel, non-invasive sampling technique for measuring circulating blood glucose concentrations in pigs. 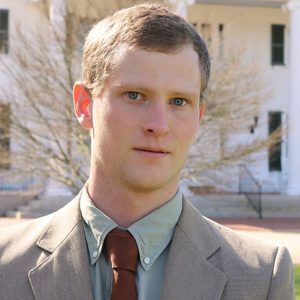 Mr. Seth Rankins, an Honors College junior from Cussetta, Alabama is pursuing a major in wildlife ecology and management in the School of Forestry and Wildlife Sciences. For the past two years, Seth has worked under the direction of Dr. Stephen Ditchkoff in the SFWS examining issues related to white-tailed deer, and more recently has been working with both Dr. Ditchkoff and Dr. Sarah Zohdy in the SFWS studying tick borne diseases, anaplasmosis, and erlichiosis in white-tailed deer. Seth’s research includes extracting genomic DNA from over 200 white-tailed deer from a marked population of deer at the Auburn University Deer Lab in an effort to quickly diagnose anaplasmosis and erlichiosis and prevent its spread. Mr. Matthew Rogers, an Honors College junior from Huntsville, Alabama is pursuing a major in software engineering. 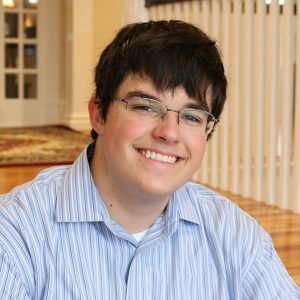 For the past year, Matthew has worked under the supervision of Dr. Anthony Skjellum, Professor of Computer Science and Software Engineering. Matthew is currently working to develop a malware analysis tool in an effort to identify ransomware – a malicious program that denies critical access to a computer system until a ransom is paid. Mr. Ayden Kish, an Honors College junior from Santa Rosa Beach, Florida is a double major in Physics and Philosophy with a minor in Mathematics. Ayden’s research, under the direction of Dr. Edward Thomas, professor in the Department of Physics is an investigation of particle transport in a complex (dusty) plasma – a novel type of plasma system in which small, charged microspheres are suspended in an ionized gas environment. His research focuses on the use of particle image velocimetry (PIV) to obtain time and space resolved measurements of the motion of the microspheres in order to determine the electrical properties of the background plasma and the forces that lead to poloidally rotating structures in the complex plasma. Upperclassmen and transfer students will be given preference, a max of 15 Honors students. Meals and boarding are funded by Honors College, transportation on your own. While in Greensboro, students will participate in community service with Project Horseshoe Farm inclusive of, but not limited to,: building repair, classroom/student activities lounge preparation, community garden work. If you are interested in this Honors College ASB or if you have any other questions, please do not hesitate to contact Ken Thomas. 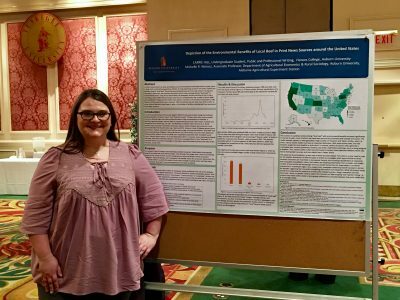 Honors College student Carrie Hill won second place in the Undergraduate Poster Presentation, during the 2016 Professional Agricultural Workers Conference-Student Competition held at Tuskegee University this December. Hill, C. and M.R. Worosz. 2016. Depiction of the Environmental Benefits of Local Beef. This summer, Auburn University students discovered calculus through Michelangelo and geology through Roman rocks in their classrooms inside a 13th century Italian palace. Next summer students will have even more options to pursue coursework overseas through the Auburn Abroad Core Curriculum Program in Rome. Launched in summer 2016, the Core Curriculum Program allows students to choose two from several courses required of all students such as communications, geosciences, math and political science while spending five weeks exploring one of Italy’s most historic and iconic cities. In summer 2017, offerings will expand to also include Honors designated courses, including POLI 1057 Honors Global Politics, COMM 1007 Honors Public Speaking, MATH 1617 Honors Calculus I, PHIL 1027 Honors Introduction to Ethics and SCMH 1010 Honors Concepts of Science. In addition to their six to eight credit hours, students also take a non-credit Survival Italian course to help them better understand and navigate the local culture. Read more about the requirements and view the application. Auburn’s strategic plan calls for internationalization of the campus, and study abroad programs are one vital way to provide students with global experiences. 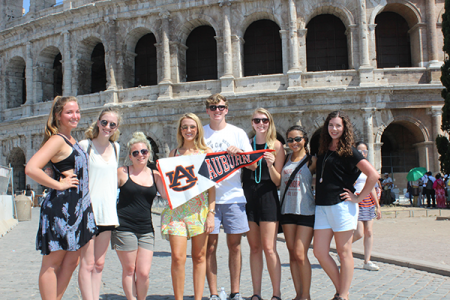 Auburn offers faculty-led study abroad programs in virtually every academic department. These programs are typically designed for students in a particular major. The Core Curriculum Program accepts students beginning in their sophomore year and is open to all students, regardless of major. Interested students can view the new video of last year’s program to get a taste of the activities in Rome including tours of Florence, a food tour of Rome and student testimonials. The 2017 Core Curriculum Program will run May 15 through June 15. Applications are due February 15, 2017, and students are encouraged to apply early. Students interested in any study abroad program are invited to attend the 30-minute Study Abroad 101 session offered Thursdays at 3 p.m. and Fridays at 11 a.m. in Foy Hall room 242. 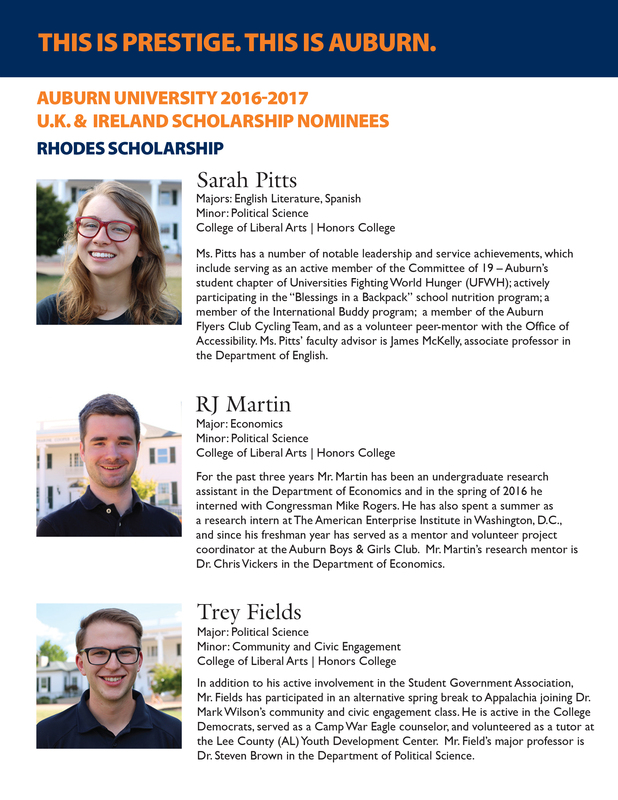 Auburn University senior Sarah Pitts is a finalist for the prestigious Rhodes Scholarship. If awarded, she will be among 32 U.S. students to receive the honor of studying at the University of Oxford in the United Kingdom. Pitts will interview in Birmingham in late November. Her selection marks the seventh consecutive year that Auburn University students have been named as finalists. 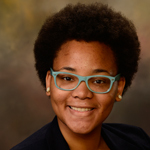 Pitts, a native of Birmingham, is an Honors College senior with a double major in English literature and Spanish and a minor in political science in the College of Liberal Arts. 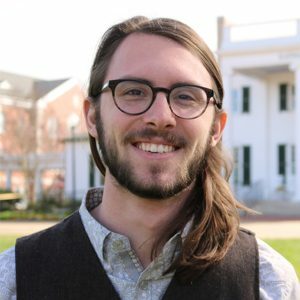 If selected, Pitts plans to pursue a master’s in world literatures at Oxford under the tutelage of Professor Ellke Boehmer, a former Rhodes Scholar, to study postcolonial literature with the goal of becoming a writer who aspires to abolish cultural barriers and forge global understanding. Pitts has been involved in a number of campus and off-campus service projects. Among her more notable leadership and service achievements are her role on the Committee of 19, Auburn’s student chapter of Universities Fighting World Hunger; participating in the Blessings in a Backpack school nutrition program; serving as a volunteer peer-mentor with the Office of Accessibility; and being a member of the Auburn Flyers Club Cycling Team. Pitts’ faculty advisor is James McKelly, associate professor in the Department of English. The scholarship, one of the oldest in the world, is awarded to students with proven intellectual and academic achievement, integrity of character, qualities of leadership and proven respect for their fellow humankind. Founded in 1904, the Rhodes Scholarship is one of the oldest international fellowships and are administered by the Rhodes Trust, a British charity established to honor the will and bequest of Cecil J. Rhodes. Auburn University has had four Rhodes Scholars: Hugh Long, 1949; Ed Gentle, 1978; Susan Karamanian, 1981; and Jordan Anderson, 2009. Nine Auburn University students are among the nominees for the nation’s top postgraduate honors, including the Rhodes, Marshall and Mitchell scholarships. Students awarded these scholarships will pursue their individual fields of study at prestigious universities in the United Kingdom and Ireland. Honors College senior, and Honors Congress Vice President Meghan Durboraw was featured for her summer internship work on two different news stations. Be sure to check out the sites below. A number of Honors students took part in this year’s “Summer in London Program,” an intensive six-week study abroad program hosted through the College of Liberal Arts and the Department of English, with support from Auburn Study Abroad. Most of the Honors College students in attendance took the opportunity to use the trip as a contract course, gaining a deeper understanding of the material, as well as Honors College credit. MeMe Collier, an Honors College student majoring in English – Creative Writing, contracted ENGL 3850: English Global Studies Shakespeare Goes to Hogwarts, which was a natural fit for this Harry Potter fan.